The Junior Conservatory Music department offers exceptional instruction, travel to festivals and concerts, and performs in high-caliber concert venues. From Christmas concerts in the historic California Theatre to parades and music workshops at Disneyland, Junior Conservatory students in grades 6-8 often play on stages typically reserved for professional musicians. Students may take private lessons in their instrument of choice from top instructors in the Conservatory’s extensive Private Studio Program. Junior Conservatory music classes include Alpha Band for beginners or students who want to learn how to play a new musical instrument (no experience necessry); Advanced Band to develop technical and musical skills (audition required); Quest Band, the elite performance group comprised of the very best musicians at VCJH (audition required); Jazz Studio Band, to develop performance skills in jazz, world beat and contemporary music styles (audition required); Cadet Strings, a class for developing musicians with a minimum of six months on violin, viola, cello or string bass; Advanced Strings (audition required); Chamber String Ensemble, an advanced level class (audition required); Alpha Drums, for students learning to drum for the first time; Advanced Percussion for intermediate-level percussionists (audition required); Quest Percussion Ensemble, the most advanced Junior High percussion group (audition required); Quest Choir, to learn proper vocal technique, beginning music theory, and harmonizing; JH Vocal Ensemble, the advanced vocal group (audition required). 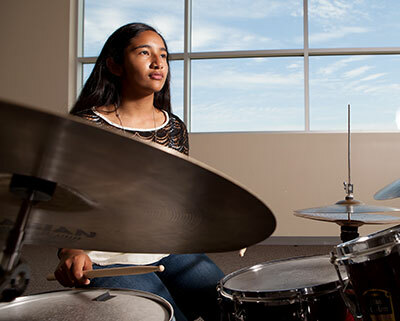 Classes are also offered in piano, and the Junior High has an extra-curricular Worship Band.